In news from China this week, the Huazhong University of Science has won the ASC16 Student Cluster Challenge. 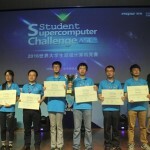 The final round of the competition concluded Friday in Wuhan at the Central China University of Science. Today Boston Limited and CoolIT Systems sent out congratulations to the student team from EPCC at The University of Edinburgh for their 1st place ranking for the Highest LINPACK in the history of the ISC’14 Student Cluster Challenge. For the first time ever, HPC professionals will be competing against the SC13 Student Cluster Competition teams in a winner-take-all cluster showdown. The new event will begin right after the students turn in their last SCC results Wednesday afternoon on Nov. 20, 2013.